Michelle's Handcrafting Blog: It's Oh So Quiet! I like to do my jewellery making at night, I enjoy the piece and quiet and I'm able to get on with my creating, without any interruptions. I'm lucky enough to work from home, so when, the twins and partner are off to school and work, my day is filled with housework, nipping to the shops or the post office, to post orders, then it's working on my websites, taking pictures, which I love doing, one day I'm going to take a photography course, then editing, ordering stock and working on my Twitter, Pinterest, Facebook accounts, which are all very addictive, I can quite easily get lost in Pinterest for hours and hours. I made this bridal comb late one night. I started round 11pm by the time and finished at 1.30am. the only one's awake was myself and my cat Bobby, who normally sleeps next to the radiator, who can blame him with the awful weather we have been having. 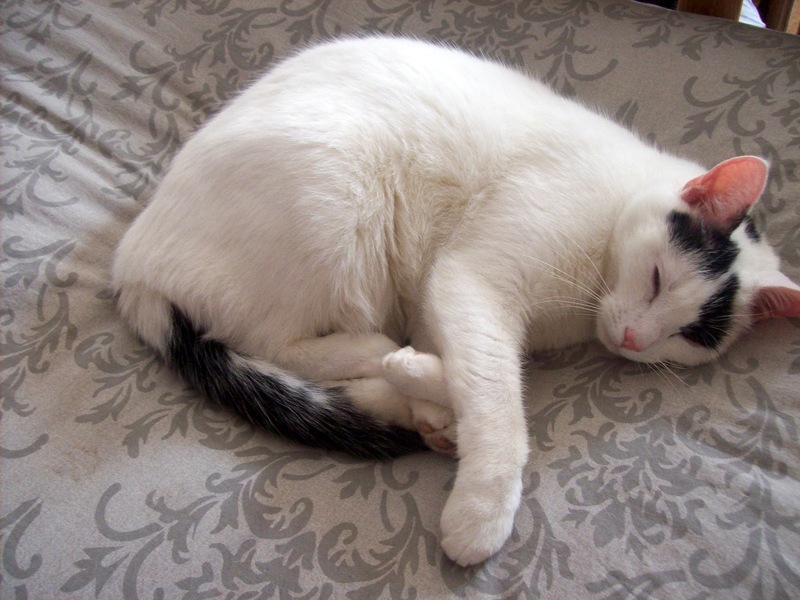 Today he has sneaked up onto my bed, grrrr.. I chose to add some red Swarovski crystal bicone beads and made them into beaded flowers, as red is one of the hottest bridal colours this year! I made the bead and crystal bead sprays first, using 0.4mm silver plated beading wire. 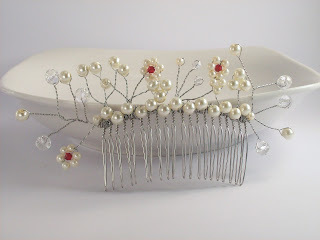 When I felt I'd made enough, I laid them against the comb and played around with them, till I was happy with the layout. Then I began to attach each spray, one at a time. I'm very happy with the result. I don't stay up every night, only a couple of nights a week. In the early days, I was staying up till 2 am in morning, then getting up at 6am, to get the boys ready for school and I felt tired all day, but now I don't do that anymore, well I try not to, lol. When do you do your crafting, are you a night person like me, or you can craft anytime of the day? Love Bobby Michelle, he looks very contented now he's sneaked onto your bed! 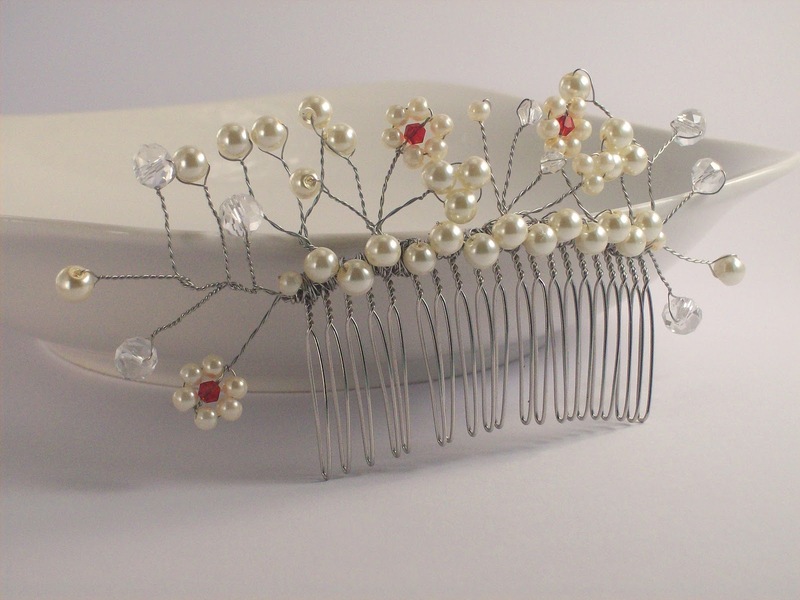 The comb is very pretty, I love just the little hint of red. I'm definitely not a nighttime person, my crafting time is limited to the weekends but I can only imagine how many disasters I'd have if I attempted anything at night!